You can make your own baby cereal, like this millet cereal for baby, with rich whole grains as a great replacement for white rice baby cereals, and it’s easy to make! 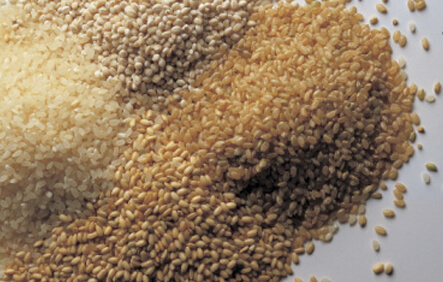 See why Dr. Greene recommends brown rice and other whole grains here. In dry skillet over medium heat, toast 1 to 2 cups brown rice, barley, quinoa, or millet for 10 minutes, stirring occasionally. Grains should begin to pop. Cool completely. Store in covered jar. To serve: Grind desired amount of toasted grain to fine powder in seed grinder or blender. Whisk together 1 part cereal powder and 6 parts water. Bring to a boil, and simmer uncovered for 30 to 40 minutes, or until soft and smooth. For the rest of the family, use 1 part cereal to 4 parts water. Cook 15 to 20 minutes. Cathe is the author of Simply Natural Baby Food, The Vegetarian Mother's Cookbook, and Lick It! Creamy Dreamy Vegan Ice Creams Your Mouth Will Love. You can find more of Cathe on her blog. Can you make a batch of the baby cereal and refrigerate it or freeze it?